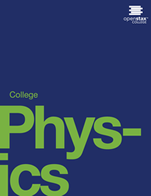 'Welcome to College Physics, an OpenStax College resource created with several goals in mind: accessibility, affordability, customization, and student engagement—all while encouraging learners toward high levels of learning. Instructors and students alike will find that this textbook offers a strong foundation in introductory physics, with algebra as a prerequisite. It is available for free online and in low-cost print and e-book editions. College Physics is organized such that topics are introduced conceptually with a steady progression to precise definitions and analytical applications. The analytical aspect (problem-solving) is tied back to the conceptual before moving on to another topic. Each introductory chapter, for example, opens with an engaging photograph relevant to the subject of the chapter and interesting applications that are easy for most students to visualize. You just viewed College Physics. Please take a moment to rate this material. If you know the author of College Physics, please help us out by filling out the form below and clicking Send.